2. Locks patrons out of the stall so that they don’t see the broken fixture or accidentally use a non-functioning unit. Watch our video to learn more about the reusable Block-Aide door lock and sign. Can’t see the video? Read the article below to learn the features of the Block-Aide and see how it works as 2-in-1 out of service sign and stall lock. The next time you have a restroom out of order and you need to let people know, instead of making a handwritten restroom out of order sign on a piece of cardboard, or covering the fixture with a garbage bag, you should use a Block-Aide door lock and out of service sign. It’s a nifty little device that is a 2-in-1 out of order sign and door lock designed specifically for out of order partition stalls. The Block-Aide sign has the following dimensions: ⅝”H x 3”W x 1-½”D. The unique locking design of the Block-Aide makes it so patrons cannot open the stall door when it is in use. It locks people out of the restroom stall, so that they cannot go in and see the out of order fixture, or worst yet, use it by mistake. The Block-Aide is very easy to use. You just slide it down between the pilaster and door. The placement of the sign then works as a stall lock, blocking customers, students, patrons and the like from entering the out of order restroom stall. You already have enough to deal with when a fixture stops working. Fix broken fixtures faster by focusing on the problem at hand instead of making a sign. With the Block-Adie, you can quickly slip the bathroom out of order sign and stall lock between the pilaster and the partition door. Then you can move on to complete the repairs you need, and focus on getting the toilet or urinal working again. Make your job easier by keeping a couple of Block-Aides in stock so you can easily inform and lock-out patrons when a stall is temporarily out of service. Keep a couple of Block-Aides in stock, and make your next out of order restroom stall repair job easier on yourself, and professionally identify the situation to restroom users. Call to place your order. 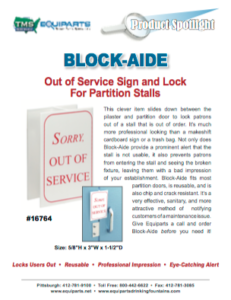 Want to Share the Block-Aide Restroom Out of Service Sign and Stall Lock? Save, Download or Email the Block-Aide PDF. Do you sell these to the public? I need 2 of them.